We combine general family dentistry with the latest technologies in preventative, restorative and cosmetic dentistry. Members of The Employee Network will receive an electric tooth brush! Because we know you don’t enjoy brushing the old fashioned way!! Discover how Dobson Ranch Dental Care can give you the smile you’ve always wanted! 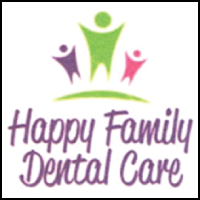 Happy Family Dental Care is an Amazing Dental Practice for all of your friends and family. New Patients (with insurance) from The Employee Network will receive free in office whitening OR a free electronic toothbrush. New Patients (without insurance) from The Employee Network will receive 40% OFF of any out of pocket expenses. *Limitations apply, please call office for further details. In our dental office you’ll never feel like a number. We believe that you’re why we enjoy what we do; it’s our privilege to assist you in obtaining optimal dental health. We invite you to become part of our dental family. New Patients from The Employee Network receive $50 Gift Card to Amazon or Target.